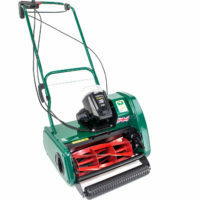 The Liberty 35 is the 14″ self propelled mower in the Liberty Range of battery powered cylinder mowers. The machine is equipped with a 5-bladed cutting cylinder delivering 88 cuts per metre (equivalent – Sandringham 14E). Powered by a 40V Lithium Ion battery it has five pre-set cutting heights ranging from ¼inch ”“ 1 ¼ inch (6mm-32mm) . For additional lawn care tasks the following optional cartridges are available for the Liberty 35; An Aerator, Scarifier, Verticutter, Lawn Brush, Dethatcher and a 10 bladed cutting cylinder. Using the advances in new technology to give you more benefits and the convenience of cordless mowing, Allett are proud to announce the launch of their Lithium Ion battery powered cylinder mowers.